Best Fire Equipment Company was founded in 1966. The company is based in Napa, California and provides fire extinguisher and fire safety equipment service to Northern California Wine Country businesses in Napa, Solano, Sonoma, Marin, Mendocino, Alameda, and Contra Costa Counties. The business has been family-owned and operated by the Del Schank family, since 1977. The Owner: Del Schank, Sr. 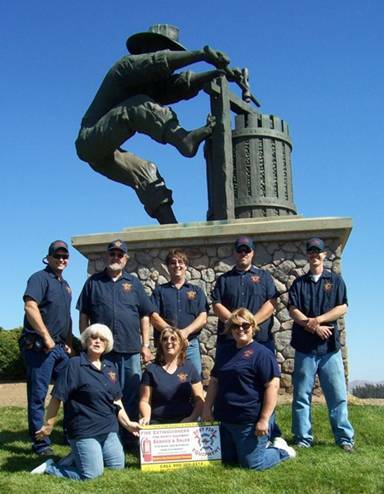 Prior to operating Best Fire, Del was a California Department of Forestry Fire Captain serving in Humboldt, Napa, and Yolo counties. Del Sr. has retired and tries to stay away from the day-to-day operation of the business. After running the business for 32 years, he's found retirement a challenge, so he still drops by the shop to service a fire extinguisher (keep his hand in) and provide guidance for the rest of us. Honorable Mention: Mrs. Del (Janice) Schank, Sr., shown in the front row, left. Responsible for keeping Del Sr. in line! Del’s son, (aka Del 2), came to work for the company in 1993. He previously worked in the construction industry as a journeyman carpenter. Del 2 has taken over as President of Operations and Service. He is the technical expert for all service and installation issues as well as the day-to-day operations. Marie is Del Sr.'s daughter and she came to work for the company in 1998 as the business and office manager. Marie handles the vendor relations, accounting and bookkeeping operations. Don is the Service Manager and is responsible for scheduling. Brian is a Senior field service technician performing on-site service for our employees and customers from our fleet of mobile service vans.